SeaQuest CEO Vince Covino, and his brother Ammon, have a long history of legal problems and controversies surrounding animal care. In April 2017 a former employee at SeaQuest Las Vegas came forward with disturbing reports about animals dying from neglect and mistreatment. 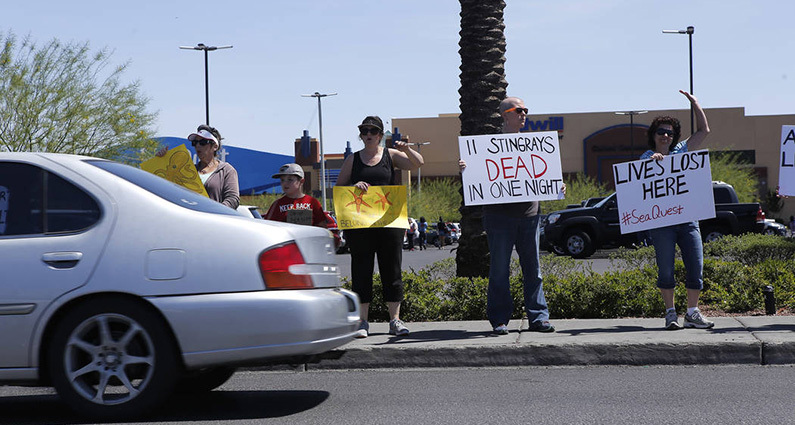 The employee told the Las Vegas Review-Journal that at least 300 animals, including eels, stingrays and octopuses, died before the aquarium even opened. An aquarium operated by the brothers in Portland, Oregon also faced accusations of poor animal care and large numbers of animal deaths (the Portland Aquarium closed in 2016). In early 2017, Vince Corvino was fined $5,000 by the State of Idaho for failing to disclose his history of securities industry violations to potential investors in new SeaQuest aquariums (Covino’s registration as a securities broker-dealer was suspended in 2011). In December 2013, Ammon Covino was sentenced to one year in federal prison for conspiring to purchase protected species of rays and sharks illegally captured in the Florida Keys for display at an aquarium operated by the Covino brothers. Ammon Covino was sent back to prison in 2015 for violating the terms of his release after he was found to be involved in the opening of the SeaQuest aquariums in Nevada and Utah. The majority of saltwater fish and invertebrates found in aquariums are captured in the wild because they are difficult to breed in captivity. The collection of large numbers of fish and other animals for the aquarium trade is harmful to the reef ecosystem.